Nigeria’s win over Iceland has boosted the hopes of Jorge Sampaoli’s side. GROUP D IS going down to the wire, following Nigeria’s 2-0 win over Iceland today. Croatia’s 3-0 victory over Argentina last night meant Zlatko Dalić’s side were guaranteed progression to the last-16 as a result. However, the other three teams in the group can all still join them in the second round. Here’s a look at how the group stands via our score centre. The remaining games see Argentina face Nigeria and already-qualified Croatia — who are planning on resting key players for their next game — take on Iceland. If Nigeria beat Argentina, they will progress regardless of what happens in the other match. If Argentina win and Iceland drop points, Sampaoli’s men will progress. If both Argentina and Iceland win, it will come down to goal difference and possibly even goals scored, with Lionel Messi and co essentially needing to better their rivals’ result. So if Iceland win 1-0, the Argentine side will need to prevail by at least two goals, and so on. If both games end in draws, Nigeria will progress. In order for Iceland to progress, they need to beat Croatia and hope Nigeria either draw or lose to Argentina by as many or less goals than they beat the Croats by. Email “Messi and Argentina's World Cup hopes are still alive - here's how they can progress”. 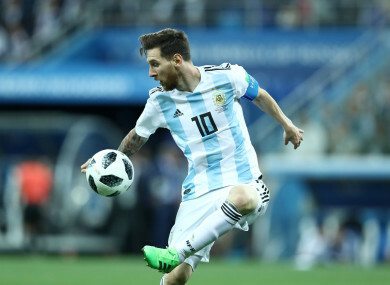 Feedback on “Messi and Argentina's World Cup hopes are still alive - here's how they can progress”.